The death toll from the cholera outbreak in Harare’s high-density suburbs of Glen View and Budiriro has risen to 16, with health officials yesterday quarantining and decommissioning all possible sources of the disease. The disease has since spread to the Midlands province in Gokwe North where four cases linked to the Harare outbreak have since been isolated. 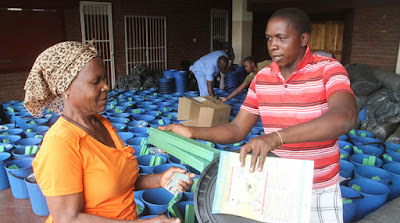 A visit to Glen View in Harare by The Herald yesterday witnessed residents of the area queueing to be tested and treated, while others were receiving two bars of washing soap each, water treatment tablets and two 20-litre containers. Residents interviewed said the outbreak was as a result of the local authority’s failure to consistently supply running water, as well as failure to collect garbage. Harare City Council health director Dr Clemence Duri said in an interview that authorities were continuing to monitor the affected areas through response teams deployed since last week. “The death toll has risen to 16 after more people died of suspected cholera today (yesterday) morning,” he said. “Although we are not yet sure of the cause of death, we are suspecting it is cholera because of the symptoms presented. Dr Duri advised residents of the affected residential areas to present themselves early to health officials as they were being treated for free. He urged communities to practise good personal hygiene like washing hands after visiting ablution facilities, buying food from licensed premises and using aqua tablets and Water Guard to treat their water. Dr Duri said people should treat water regardless of the source and desist from the notion that borehole water was safe. The disease has spread to the Midlands Province after four cases linked to Harare were reported in Gokwe North. Midlands Provincial Medical Director Dr Simon Nyadundu confirmed four suspected cases of cholera which the ministry attended to. He said the province, by virtue of being central, was on high cholera alert. “We have four cases of cholera that have been reported in Gokwe,” said Dr Nyadundu. “There was one at Nembudziya and three at Gumunyu. All these cases are linked to Harare. These people travelled to Harare and it is suspected that they contracted cholera there. “The province has those four cases only, but since Midlands is at the centre of the country geographically, there is high risk of the disease spreading to the province, so we are on high alert. Dr Nyadundu said the Ministry of Health and Child Care had already set a cholera treatment camp in Gokwe North as part of its rapid response. He said the ministry had also managed to contain typhoid in Gweru, after eight people died from the disease recently.